Though the free politics overhaul shows promise. Empire Divided is a $15 / £12 DLC for Total War: Rome 2 set in the fractious era of the late third century. You can play as ten factions split across five cultures, covering the divided and troubled fragments of the Roman Empire, the Germanic Kingdoms, the Britannic Celts and the rising Sassanids to the East. The pack includes some new mechanics that reflect the unruly nature of the times, and showcases the new politics system rolling out across all Rome 2 campaigns. The Empire Divided campaigns feel like they start mid-flow; most of the factions start with plenty of territory. In the case of the Sassanids and Rome this feels like having a binder of info dropped on your desk. You have a huge pile of money, lots of empty building slots to fill, and more buildings to think about. Empire Divided adds cults, banditry and plagues to the world to reflect the collapse of order across territories, and the new buildings are largely geared towards managing public order and keeping down bandit levels (high banditry saps food, leading to unrest). The cult structures are the most interesting of the bunch. These free buildings let you welcome in Christianity, Mithraism and Manichaeism for stat bonuses, but the introduction of new ideas creates civil unrest over time. They are expensive to get rid of too, so it's a 'borrow now, pay later' deal if you decide to throw the cult out of your territory. If you enjoy massaging the buffs/debuffs balance for industry and public order then the new buildings give you a few extra levers to pull, but managing the passive menaces of plague and banditry is an administrative activity that doesn't do much to capture the concepts being simulated. Countering these effects does limit your building slots, forcing you to make tougher decisions about your remaining city blocks, in theory, but across large empires I haven't felt that squeeze. Banditry levels can be altered by the presence of your armies in a particular province, but mostly these problems are solved by just building the buildings designed to solve the problem. It doesn't require much player thought or strategy. Personally, I'm in it for the new units, and there are a few, ranging from the awesome cataphractarii heavy cav to more subtle variants on existing units, and some neat visual differences for the splintered Roman factions to reflect their diverging cultures. The rhythm of the campaigns haven't yielded many opportunities to utilise the troops fully yet however. My play time has been heavy on admin and light on conflict. 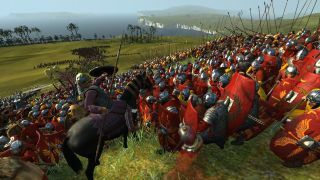 The big players take a while to move against one another, and small raiding forces are a greater concern if you're playing one of the more established factions. The starting positions show some promise. The Sassanid setup is so strong and comfortable that it presents a great opportunity to surge west and smash up the Roman factions using their awesome immortals and armoured war elephants. I also enjoy the new dilemmas and story excerpts that communicate some of the history of the time—a welcome addition, but slim. Tech trees are now designed to reflect the evolving governing practices of the leaders of each faction, which is another neat change, but a cosmetic one. Each step up the tree still unlocks buildings and units at the rate you'd expect. Empire Divided from feeling like a remix rather than a renovation, and it doesn't offer a substantially new experience to Rome 2's other campaigns. The package is improved by the free politics overhaul that now works in any Rome 2 campaign. This does a much better job of showing which political parties have influence in your empire, and where. Naturally you can undermine opponents and promote useful allies, but I need to dig in more to find out how nefarious you can get, and how much effect the new system really has across campaigns. It certainly feels a lot fresher than Empire Divided. If you really want to play a dark, plague-ridden Total War, try the excellent Attila instead.